So what’s one to when he has a spare day in Hong Kong…. well a good lunch (with the right amount of wine) dulls the senses, enhances the charm of the location and of course is a captivating way to experience the city. 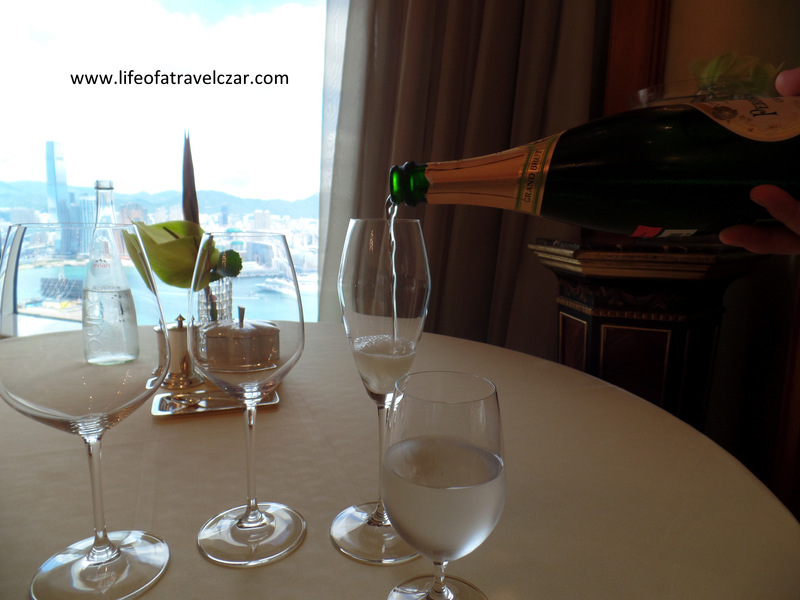 I have booked lunch at none other than Restaurant Petrus in the Shangri-la Hotel on Hong Kong Island. When you step into the venue you stop and just gaze in wonder that the location… is it the floor to ceiling views of Victoria Harbour?, the opulent grandeur of the decor which transports you back to Paris when the Bourbons were still in power or the twinkle from the wonderful chandeliers? The super friendly staff welcome me to the restaurant and have me seated at one of the best tables in the house. To start, they bring out some freshly baked bread. They are warm to touch and there is quite the selection. I would love them all, but I decide to opt for the flaky pastry style bread which just does it for me. There are a selection of butters too, I opt for the Chilli butter (red one) and there is also a wide selection of nine different sea salts to pair with the bread. What a way to start… although I opt to skip the sea salt on this occasion. To commence with the lunch menu, there is a light amuse bouche of Potato mash and sautéed mushroom served in a shot glass. The creamy smooth but light grainy potato offers an effortless tasting but is touched with the smoky earthiness of mushrooms to finish. A delightfully pleasant way to start the afternoon. 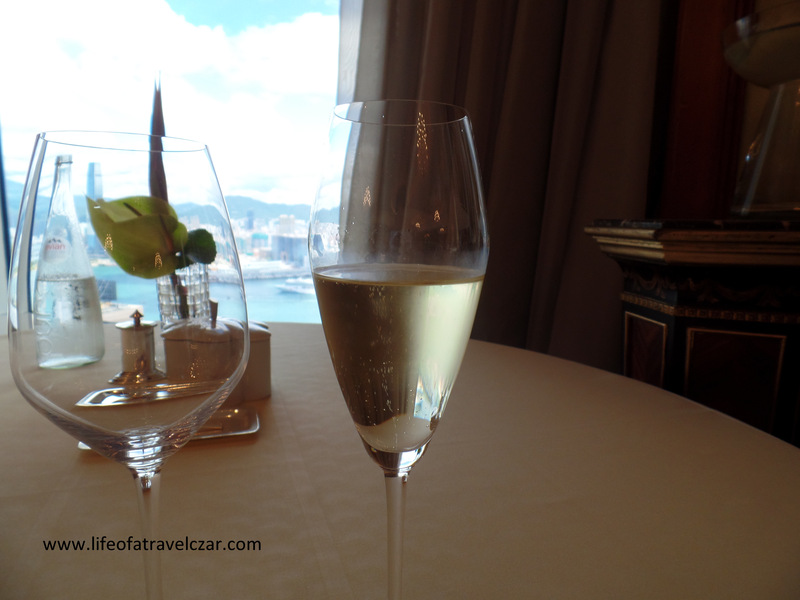 It isn’t a civilised lunch without a glass of champagne. So the champagne flows and beautiful flavours of apple and citrus combine to do a little dance on my tongue. The freshness and vibrancy and lively acidity of the champagne proves to be an amazing little kicker for the afternoon. There are soft pieces of whole avocado and avocado puree which offer a creamy flavour and smooth texture to start. The prawns are succulent with a polite firmness about them while the spicy seasoning adds flavour to the natural blandness of avocado. Then the light tang and salt of the vinegar cuts through the dish to round it out. The fresh citrus and vibrancy of the champagne proves a lovely accompaniment to the first course. To pair with the second course, I opt for a Chardonnay from Burgundy. The wine (on recommendation from the sommelier – who is excellent) has beautiful citrus (primarily lemon), pear and floral aromas which escape the glass to create a lovely waft to introduce itself. The wine is medium bodied with a vibrant character and a crisp linear finish with plenty of fresh minerality. The minerality of this Burgundy chardonnay is the perfect pairing to balance the next dish (the frogs legs). A very classic French dish indeed. It has a beautiful look and ticks the boxes on the aesthetics. The dish is about contrasts which is highlighted by the combination of the sticky rich yolk, the crunchy Kadaifi-like pastry, the sweet succulent frogs legs, the peas, the soft but firm egg white (which just disintegrates on the tongue). It is such a sensuous experience with a stunning array of flavours, textures and interaction between the key ingredients to create a unique taste sensation. The frog legs were just super silky, succulent and a very memorable experience. The Riserva Vigna Paganelli is produced only in the best years and in limited quantities. This wine comes from “I Paganelli” vineyard, the oldest vineyard on the estate which was originally planted in 1964. The intense dark red colour glares at me through the decanter while the aroma of fresh red fruits, leather and light spices fill the atmosphere. It’s a well-balanced wine with beautiful full flavours of dark red and black fruits and is silky smooth to drink. The wine is six years old and has well-developed hints of tar, licorice and tobacco which continue to be extenuated as the afternoon continues as it develops in the decanter. I just love this wine… I know I am going to get heartbroken when the last drop leaves the decanter. The dish is like a rich stewy casserole. The soft gelatine like tripe encases the tender stewy sheep’s feet pieces with a herby and garlic overlay through the sauce. The parmesan chips add a crunchy texture contrast while providing some sharpness to the dish. The tripe is a soft melt in your mouth style taste experience, while the pungent earthy flavour of the truffle streaks through to cut through the dish and add a level of charm and decadence to the tasting experience. Its a rich hearty dish that pairs perfectly with the wine. A truly satisfying experience. I opt for the goats cheese, however the waiter insists I have some of the Époisses to round out the experience. I won’t go through the whole platter, but I will focus on a couple of favourites. The goats cheese (middle) has a lemony tone with a deep rich creamy earthy flavour with the light ash rind providing some additional texture and smoke to the cheese. The Époisses (far right) is the strongest of the cheese. It is the pinnacle of strength and flavour. This inside is super soft, spreadable, sticky, milky smooth with a silky velvety texture, while the outer dark orange rind is crumbly, pungent, salty and nutty. It is a taste experience one must have. Caraibe is a bitter chocolate which is compounded by the cocoa nibs which are dark, crunchy and bitter (like coffee beans) – the ultimate of “bitter / sweet” taste with the pure creaminess of the vanilla ice cream flowing through to mitigate the bitterness and draw out cocoa flavour. Then the Fleur de sel intervenes. It is a salt from the island of Ré, off the coast of France. The salt has a lovely subtle flavour with high concentration of minerals. The intense minerality of the salt, the bitterness of the nibs and the sweet cocoa flavour is a gem of an experience. The coffee provides a fresh caffeine hit which I need to get through the afternoon. The petit fours are elegant with a wonderful array of different sweet tastes. A lovely finish indeed. I continue to nurse the wine which been such a beautiful accompaniment for most of the afternoon. I then close off for lunch and make my way to the exit. I stop to admire the beautiful lobby before grabbing my bags and heading to the airport. It’s truly an amazing restaurant traditional french cuisine with hints of Asian influence and creativity with an extensive wine list, the attentive service (which never falls short of expectations) stunningly opulent decor and of course who could ever forget the view of Victoria Harbour. Thank you so much for sharing your experience at Restaurant Petrus. We are delighted that you have enjoyed your lunch there. It is indeed our pleasure to take care of you and we look forward to welcoming you back soon!